Fashion and Law. They sound like polar opposites, but you might be surprised to learn how significant of a role Law plays in the fashion industry. Any fashion business owner can tell you there are many components behind creating a successful, long-lasting business. 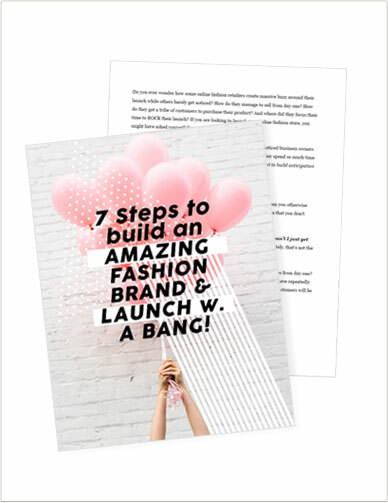 From launching your brand, to building and maintaining partnerships, to handling vendors and distributors, it’s crucial to be on top of your game from the very beginning. It’s overwhelming and even nerve-racking for some people to think about all the necessary pieces that build and protect a business. And then, there’s Fashion Law to consider. As an emerging fashion designer and business owner, the legal aspects might seem like the last thing on your to-do list, and many people shy away from learning about it. That’s why I invited the co-founders of Fashion Law Studio and partners at Nimakatz Law, Nina Ashok and Katharyn Bond. They founded the Fashion Law Studio as a means to provide an accessible education for emerging designers and small businesses concerning the legal aspects of the fashion industry. Their legal seminars are friendly and easy-to-understand, making a daunting subject more approachable for fashion designers and business owners. Today, Nina and Katharyn break down the basics, like how you can protect your business when dealing with merchandising, importing and exporting, manufacturing, and international vendors. 1) Nina and Katharyn’s legal background, particularly Law for the Arts and Fashion Industry, and their mission behind Fashion Law Studio. 2) The leading mistake new businesses make and how others can cover their legal basis from the beginning. 3) Tips to start researching and learning about the legal responsibilities of a new business (besides coming to the Fashion Law Studio). 4) How to properly handle partnership agreements and other contracts early on. 5) Which legal documents are crucial to have as a fashion business and how to anticipate potential future issues. 6) Highly informative tips on Fashion Law and what you need to do to be proactive from a legal standpoint to benefit your business. For more on Fashion Law, visit Nima and Katharyn’s website www.fashionlawstudio.com or email them at nimakatz@law.com. As always, thanks for listening, and if you found this information useful, please make sure to leave a review on iTunes and make sure to leave your feedback on topics you would like me to cover! Don’t forget to say hi by hashtagging #GLOBALINFLUENCER on Twitter or on Instagram!